“Red Theater Chicago’s production of An Oak Tree has a lot of good ideas. Written as it were by Tim Crouch, the semi-improvisational script tackles themes of loss, guilt and the ways one might manipulate reality to manage overwhelming experiences. It also leverages a handy and creative metaphor for that exploration. 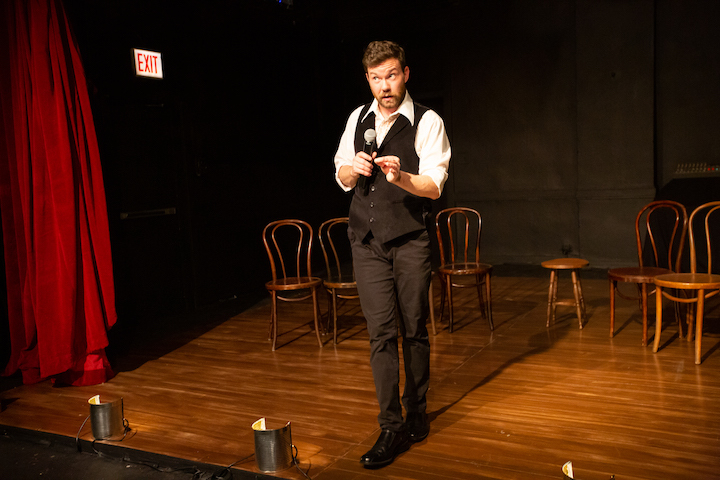 Featuring Gage Wallace as First Actor, or Hypnotist, the play’s action occurs a year after a tragedy for which the Hypnotist is partly responsible. The family-friendly practitioner of the occult has lost his mojo, a development he reveals honestly and exhaustedly to his latest audience. When the Hypnotist seeks volunteers to participate in his ‘act’ (word very carefully chosen), his eyes fall upon a man he does not recognize, but should. Without giving away spoilers, the actor who takes a seat upon the Hypnotist’s stage is intimately involved in last year’s tragedy, and the two characters begin a cerebral, transcendental verbal dance that slowly exposes their respective suffering.